The Scullmatix arrived from Duckworks, hooray! But they sent it via Parcel Force, boo! Who charged me £8 for paying £8.13 VAT. Imposing an admin charge that is almost as much as the tax itself is outrageous, and because they refuse to hand the parcel over until you have paid. it feels like extortion. Every time I have had stuff sent to me through Parcel Force it has been delayed or damaged. In one case it went to the wrong address and disappeared completely. Did they pay compensation? No. They are without doubt the worst carriers in the world. Now I've got that off my chest, back to the Scullmatix, Guy Capra's ingenious device for automating over-the-transom sculling. It is beautifully fabricated in stainless steel. Two half-shells are held together by bolts and wing nuts, to clamp an off-axis handle onto a standard rowing oar. To scull, you trail the oar over the transom, allowing it to float behind. The handle is driven smartly to and fro, and allowed to swivel so the oar is turned in the right way to move the boat forward. I spent hours trying to learn sculling the traditional way, and only managed to go forward slowly, painfully and in circles. With the Scullmatix, I was going forward slowly, painfully but in a straight line after about ten minutes. The breeze made it very difficult to turn into the wind, as her relatively high freeboard made her try to broach all the time. The best technique seemed to be to pause briefly between strokes and allow the oar to act as a rudder. It was jolly hard work for a slow speed, but practice showed slow improvement. Facing forwards was a big plus. Using muscles that have lain dormant for decades was a negative, but I imagine that will also improve with practice. I will try and get out in dead calm conditions soon, and also drag my son out so he can take a video. The standard oar has a blade in line with its shaft. this is going to try to drive the boat down not forward. Our oar has a 17 degree crank and a 30inch blade. There appears to be too much oar out of the boat. Try attaching the scullmatix about 5 feet from the oar tip. We use an 8 foot sculling oar to propel a 16 foot boat. 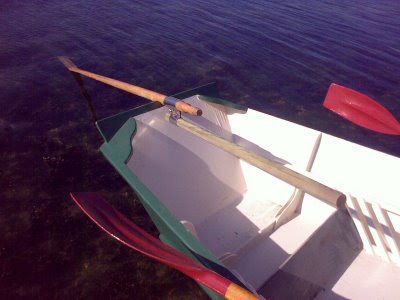 This feels about right with the sculling notch a foot above the waterline supporting the oar halfway along its length. You really need to stand alongside the oar to swing it with vigour. Your sculling notch prevents you standing at the centreline of the boat. Cut another notch by the quarter and try again. Following some disagreements as to who would row we have adopted the doublehanded technique. One crew member rows conventionally whilst the other (me) sculls and attends to the steering. I have to move fast but very powerful and efficient and no more arguements. It's taken a while to learn what the sculling oar can do for us. I really woulfdn't want to be without it now.